Eminent Australian physicist and former CSIRO Executive Member Leonard George Holden Huxley is remembered for many contributions to science and education. He established an international reputation as an authority in the fields of electromagnetism and gaseous electronics. Sir Leonard was born in Tasmania in May 1902. He was awarded a Rhodes Scholarship in 1923 and subsequently two further scholarships while in the UK. In 1929, he joined the Australian Radio Research Board which had been established by CSIR. Here he researched the origins and nature of ‘atmospherics’ which caused disturbance in radio communications ‘ disturbances originating from thunderstorms. He and a colleague started their observations while on board the P&O liner which brought them to Australia. In 1932, he became a lecturer in the Physics Department at the University College, Leicester,UK, where he was able to conduct research on electrical breakdown and produced a definitive paper, published just before the war, on electron diffusion and drift. Immediately after the war, he started researching the so-called ‘Luxembourg Effect’, in which transmission from one broadcasting station was cross-modulated by another, more powerful transmitter. Eventually this led to work on gases, particularly the constituents of air, and formed the basis of a program he actively pursued later in his university positions. He was appointed to the Elder Chair of Physics at the University of Adelaide in 1949, an appointment which marked the beginning of his devotion to university teaching which lasted the rest of his life. From 1960 until his retirement in 1967, he was Vice-Chancellor of the ANU. In retirement, he became a Visiting Fellow in the Research School of Physical Sciences, and later an Honorary Fellow. 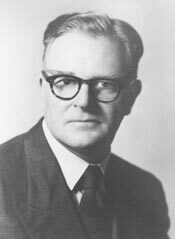 Meanwhile, in 1959 Professor FWG White (now Sir Frederick White) became CSIRO Chairman and among the Executive Members he chose was Sir Leonard. Professor White had known Dr Huxley for some time by that stage, but strangely, although both physicists with an interest in atmospheric phenomena and subsequently radar, their paths had not crossed in England in the 1930s. The former CSIRO Chairman describes Sir Leonard as ‘an extremely wise and quiet man who was very sane in his judgements’. He was sorry that Sir Leonard was unable to continue for more than a year in his CSIRO position, as he had been appointed ANU Vice-Chancellor. An interesting aspect of his long career was his work during the Second World War. His research in atmospheric phenomena led him to a vital task for the allied war effort. It became necessary to teach a vast number of people the use of the radar technology. Radar is widely acknowledged as one of the greatest factors in saving Great Britain from the fierce German air attack in the Battle of Britain, but it was a new technology with no practitioners before the war.